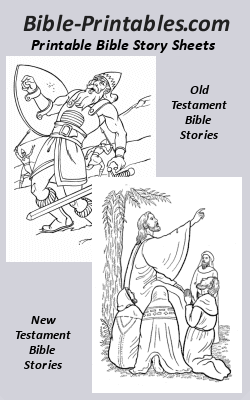 Bible Story pages augment your Bible study or Sunday School Class. These bible story sheets make great "story telling aids" to help you teach, (and students young and "older" remember) the specific events within a bible story. - For Young Learners - Print out the Bible Story you want to teach here and read it to your class.... and also, print a number of Bible Story coloring pages as an activity for your students as you read / teach then the story. - For Older Learners - Print out enough of these Bible Story Sheets to give everyone in your class a copy ! Review our collection of Bible story sheets, they are gathered together by Bible Story to help you find what you are looking for easily and quickly. Favorite Old Testament stories from Adam and Eve, to David and Goliath. Printable Bible Stories from the Old Testament for use in Sunday School Classes, and Vacation Bible School and for a good bedtime story. Favorite New Testament stories from Zacharias and Elizabeth , through the life of Jesus. Printable Bible Stories from the New Testament for use in Sunday School Classes, and Vacation Bible School and perfect for a bedtime story. Delightful and touching stories of "modern times" that teach a lesson, contain a moral, or help us relate the stories of Jesus to young children. The box to the right is a Pinterest Pin-It Ad Box ! .....Pin it NOW !!! Bible-Printables - Strives to be the higest quality provider of teaching /Learing resources for use in teaching Bible Stories, in Sunday School, VBS or any Christian educational activity ! Individuals, teachers, instructors and clergy may print the free materials provided on Bible-Printables.com for their own personal, or class, (non-commercial) use only, provided that they retain and display all copyright and/or source marking on the materials. You may NOT reprint, redistribute, save electronically, modify, transmit, post to a web site, forum, blog etc. any materials from the Bible-Printables web site without express written permission from Bible-Printables.com. Teachers and instructors may include the materials in PRINTED class projects, packets, booklets, or handouts as long the finished product is not a "For Sale" product. Please consult our Privacy/Terms Pages for further information! We hope to make your bible education learning and teaching easier and more captivating. Thank You for visiting Bible-Printables, come back often to see new material as we grow!